This might not be a problem if one or the other offered a serious option for survival, but there is little evidence for this from the past practice of either. Perhaps one of them can, but if so it needs a more penetrating analysis than one usually gets. The fact that each has continuously morphed makes the framing even less useful for a productive discussion, to the point where it is often unclear what people might mean by ‘capitalism’ or ‘socialism’. We have learnt a great deal about societies, people and ecosystems since Burke and Paine, Marx and Mill were writing, and we have a pretty fundamental new concept, the self-organising system, to bring to bear, so perhaps we can now do better at identifying options. As well, if one looks without the blinkers of either ideology it is not too hard to identify mechanisms in our societies that serve us very poorly, notably by pumping wealth to the rich, nor to find alternatives that are likely to be much healthier. It is also important to extend our perspective beyond the past couple of centuries of Western experience. It has become clear only fairly recently that our citified, ‘civilised’ way of life has been both oppressively hierarchical and hostile to nature since its origins about 6,000 years ago. There is much more to come to grips with here than Marx versus Mill, Keynes versus Hayek. There is also another broad stream of thinking and practice, largely independent of ideologies, that is focused on whether and how we can change our activities and organisation so as to have some prospect of surviving as viable societies. This comprises many things ranging from climate science and ecology through regenerative agriculture, alternative money systems, green cities, and a fully-recycling ‘circular economy’ to the shift of values that must accompany these practical changes if they are to last. We must be aware that time is critically short and the stakes are by now extreme. We may well be beyond climate tipping points, but we have to proceed in the hope that is not true. We are using resources well beyond any sustainable level and by many credible estimates the land, ocean, forests, fresh water systems, soils and other crucial components of our life support system are degrading rapidly. The underlying reality here is that we are, through food, water and air, intimately a part of a dense web of life on Earth, and its health is our health. One is routinely disappointed by the superficiality and venality of mainstream politicians and their ignorant paymasters and supporting media chorus, who resolutely focus on their extractive conception of life in Australia and on Earth. On the other hand it is disconcerting to have positive approaches attacked by putative allies, such as John Passant and his recent claim, evidently shared fairly widely among some sections of ‘the left’, that concerns about human population can only serve the cause of racism. Passant blames most of the current planetary destruction on corporate greed. One can totally agree that corporations are primary agents of the destruction. However Passant implies that if only corporations are abolished all our troubles will be over. Is it really that simple? In what I will call modern global consumer capitalism, corporations operate by cultivating materialist addictions in our societies. This makes many of ‘the workers’ complicit, which might have something to do with modern Marxists’ failure to attract a large following. Certainly we need to reduce our fossil-fuelled overconsumption, but breaking those addictions will not be simple, nor will figuring out how to keep so many people alive and thriving within the limits of a stressed planet. Even if we did remove corporations and material addiction as proximate drivers, what sort of life and society does Passant envisage would ensue? That is left unclear, apart from vague appeals to democracy and internationalism. Evidently ‘the workers’ will spontaneously reduce their consumption to supportable levels, and that will remain true no matter how many billions of people there are. There is indeed enough food to feed the present 7.7 billion mouths, but the planet is already severely stressed. Passant evinces little knowledge of or concern about this. 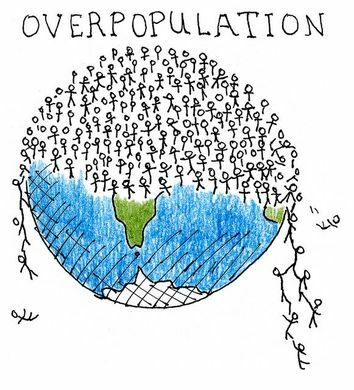 It is either ignorant or disingenuous to imply that Malthus’ old argument is the only basis for concerns about population. It is reprehensible to go further and claim ‘populationists’ are only motivated by racism. Nor was Marx the only one to point out the divorce between early capitalism and the natural environment. There were also, just for example, the English romantic poets and Henry David Thoreau. Passant quotes authorities who claim overpopulation arguments are used to oppress people. This hardly fits Australia’s situation, in which the people are burdened by the cost of a very high rate of immigration. Jane O’Sullivan makes a straightforward case that each new person costs around $500,000 in new houses, shops, schools and basic infrastructure. We are paying over $100 billion per year, in direct costs or lost amenity, for high immigration, money that could boost wages and provide services to those in need. Marx had important insights, but it is as unhelpful to regard his word as the immutable truth as it is for the Institute for Public Affairs to revere the alleged ‘liberal principles’ of Edmund Burke. If one can move beyond eighteenth and nineteenth century memes and terminology, a positive way forward emerges. Economies are far-from-equilibrium systems, which means markets cannot be left unfettered, as is obvious anyway from the grand neoliberal experiment in social engineering of the past 35 years. Markets can be useful, but they must be managed. They can be managed by attending to the incentives under which they operate, with regulation where necessary. Governments have essential roles, as the implementers of our collective will and to run natural monopolies and oversee other critical services. The present total corruption of our democratic system needs to be and can be ended, through people power, transparency and strict limits on ‘donations’. Banks ought to be a small and carefully regulated service. Media ought to be held to responsibilities to balance the immense privilege they exercise, and preferably could be owned by their audiences. Local collective ownership can be fostered, better ensuring a fair flow of wealth reaches those who generate it. Our assault on the land and planet can be quickly reduced just by widely adopting many practices already available. Economic management can focus on simultaneously reducing quantity (of resources extracted, through a circular economy) and improving quality (of life). A better way forward is there for us to pick up and do. This is not the naïve and oxymoronic green capitalism of ‘sustainable growth’. Rather it is a harnessing of the best of our creativity and our immense modern knowledge to the cause of thriving within Earth’s abundant biosphere.